I decided to make the TW quilt Twin size. I'll give it to one of my grand daughters who was born in Tennessee. I pieced and quilted it on my Bernina 750 (my workhorse) I love this machine. I washed it so it would go ahead and puff up. 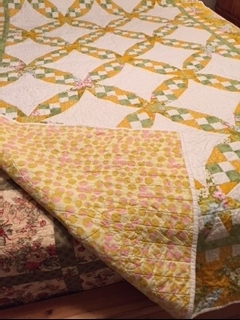 Soon you will see another Twin quilt made with the same fabrics, however I'm using Road To Oklahoma pattern.